*To season you can add salt and pepper but I prefer to dress the salad just with the olive oil and a squeeze of lemon when I feel there is a need for it. 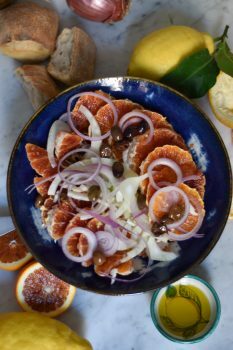 There are so many versions of this salad, the only constant is the oranges. The olives and fennel are your choice. Peel the oranges very carefully and slice them whole to get the shape of a wheel. Actually you can cut them any way you like, half moon shape or big cubes but they should not be too thick or too thin. Arrange the orange slices on a serving plate, now add a layer of sliced fennel and onion rings. Top with olives and sprinkle with parsley leaves. After a couple of minutes the oranges will start to release their own juices, the blend of that juice and olive oil is the best dressing for me.